By 1963 Bitzer had demonstrated the success of his now-legendary automated teaching system, PLATO, within the limited, controlled environment of the Coordinated Science Laboratory. Bitzer and CSL director Daniel Alpert understood that putting PLATO in practice for large numbers of students—in essence, transforming it from a classroom into a system—would require more than replacing the ILLIAC I, a relic from the days of "big iron" that served as the original mainframe for PLATO's time-sharing network. A real-world PLATO would also eventually require a better way of visually mediating the exchange between computer and student. At that time, almost all devices for interacting visually with computers were alphanumeric displays that could only render letters and numbers, not the graphics required for teaching and learning many subjects. 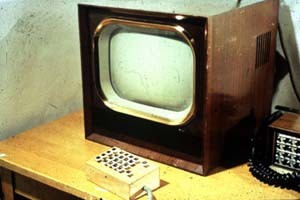 Bitzer rigged a system using radar display tubes that could digitally read pictures and alphanumeric characters from ILLIAC I, then transmit the images by cable to TV terminals at each student station. The system worked well enough while PLATO was in a proof-of-concept phase. However, the constant refreshing of the image that is required in a cathode ray tube, while fine for TV, didn't lend itself well to the sustained display required for graphics. The tubes had no memory for holding an image, and the cheap computer memory that makes tubes suitable for graphics today was a dear resource in the 1960s. PLATO would require a better display for the long haul. Bitzer enlisted Willson, then a graduate assistant, and Slottow, then a research engineer, in the task of exploring how a matrix of discrete neon cells might be driven by a high-frequency ac current, using capacitors at each cell so that individual cells, or pixels, could be addressed. The big breakthrough came one summer evening as Bitzer and Slottow waited outside CSL for their wives to pick them up after work. They began discussing the project in terms of its barest essentials and realized that the simplest configuration would be to exploit the natural capacitance of the glass on either side of a panel, which could be done by placing electrodes on the outside of each cell, separating the driving current from the gas. Next morning, the team set about building a new device. With Willson doing most of the handiwork, they ultrasonically drilled a hole fifteen thousandths of an inch wide into a thin glass slide, then sandwiched that slide between two others. They deposited thin-film gold electrodes on the outside surfaces to carry a high-voltage driving source. They sealed the sandwich with epoxy on three sides and glued it to a vacuum pump on the fourth, then pumped it clean and backfilled it with neon. It was July 1964, and the first ac plasma display panel had been built. The panel's single cell operated on the fundamental rules that govern the millions of cells in one of today's panels. 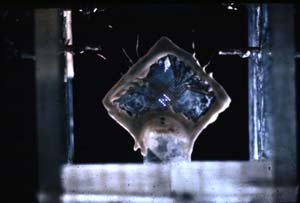 After this initial success, the team learned that nitrogen from the air had leaked into their cell, accounting not only for its blue hue, but also for its good "memory margin"—its property of remaining lit in the presence of a "sustain" voltage significantly lower than the "breakdown" voltage necessary to initiate the discharge. 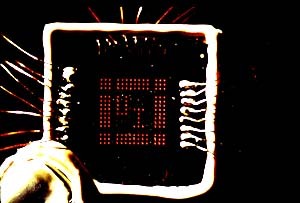 By 1967, the inventors had figured out how to achieve good memory margin using just neon, and they had developed the driving circuitry necessary to address a large array of pixels. (Alpert had kept Bitzer's research under his wing after becoming graduate college dean in the mid-1960s. After the move, Bitzer's lab was renamed the Computer-based Education Research Laboratory.) That year, they built a 16 x 16 panel that glowed orange, thanks to the purer neon mixture. PLATO screens and other plasma panels for years to come, here at the U of I and beyond, would radiate the same orange. In its "on" state, a plasma cell actually flickers thousands of times per second. Every time the ac sustain voltage reverses polarity, its corresponding field within the cell realigns with an alternating "wall voltage" emanating from the glass, creating a total cell voltage sufficient to ignite the discharge. A new wall voltage of opposite polarity then begins to build up until it cancels the cell voltage, extinguishing the discharge, and a new cycle begins.